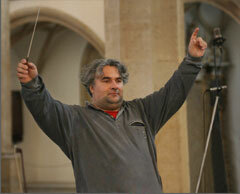 Composer, conductor, pianist, choirmaster, organist and teacher Miloš Bok was born on 16th January 1968 in Prague. He graduated in piano playing in 1988 at the Prague Conservatoire under Jaromír K?íž and, shortly after, became Josef Pálení?ek’s last student at the Prague Academy of Music, where he studied until the latter’s death (1991). Under the communist regime, he was prevented from studying conducting and composition. After the fall of the totalitarian regime, he has studied conducting under Mario Klemens, again at the Prague Conservatoire (1991-1993). During his youth, he has won six prizes in various national and international piano competitions. Since 1987, he has been teaching in various primary schools. In 1998, together with several friends, he founded the Elgar Art Society. Since 1999, he is leading the Western Bohemia St Cecilia Sinfonietta, an ensemble formed of students of Karlovy Vary’s elementary and music schools in which he had been teaching during the years 1999-2016. In 2002-2011, he has also been leading the Karlovy Vary Mixed Choir. He has performed many works of church music with these ensembles, both for liturgies and at concerts. Numerous important Czech orchestras and choirs have performed under Bok’s baton. His work is documented on a whole series of recordings, and he has been the subject and appeared in many programmes for the Czech Radio and the Czech Television. He is also active as organist in the dioceses of Plze? and Litom??ice. He is composing since his childhood. After his first unfinished attempts (a piano concerto and a symphony), his gradual conversion to Catholicism led him to realise that his role in life would be to lift church music up. Thus confined, his creation and activities have touched upon all music forms, and his work has given birth to a very distinctive original musical world. His first finished work, the Missa Solemnis (1986), ranks among the most performed contemporary vocal-instrumental pieces (more than fifty performances, in 1999 in Carnegie Hall and in 2015 in the St Vitus and Adalbert Catherdal in Prague). It was followed by several smaller pieces: the Missa Brevis in E flat major (1987) and Missa Brevis in F sharp major (1988, rev. 2003), as well as many smaller works intended to accompany the liturgy, from festive mass songs (Lord, Have Mercy, 1996; Alleluia, Be Alive, 2007; I Believe One Church, 2008…), through original adaptations of psalms and hymns (Hymn to the Holy Ghost, 2005; De Profundis, 2009; Psalm 131, 2010, Magnificat, 2011), cycles of Christmas carols (Symphonic Carols, 1998; Dreamy Carols, 2006), up to Choir songs for a Trappist monastery (2001). His monumental Credo in F Sharp Minor (2006) also has to be pointed out, whose length exceeds the regular framework of the mass rites and constitutes the composer’s personal confession. In a personal letter from 2006, Pope Benedict XVI has highlighted the quality and the conversional effect of Bok’s music. In 2015, the Czech Bishops’ Conference has awarded Bok for his church music and his activities for the Catholic Church. of K?inice (1993) which was greeted by an enormous success at the author’s graduating concert for the end of his conducting studies in Prague’s Rudolfinum Hall. It was followed by Saint Zdislava (2001), from which only selected extensive parts have been performed by the composer as of now. The last oratorio, still under work, is The Apocalypse on the Slopes of Kamenice, whose first part Bok finished in 2012 and has been performed with great success in 2016 by world renowned conductor Manfred Honeck with the Czech Philharmonic in Prague’s Rudolfinum Hall. The whole trilogy of oratorios constitutes a completely new and modern kind of spiritual composition. Formally, they combine a grandiose sonata layout with a principle of individual attacca sections whose titles and abstract text by the composer himself guide the listener’s imagination. Bok’s unique trilogy of oratorios, permeated with autobiographic elements, is a great meditation on death, the sensation of the upcoming apocalypse, as well as a celebration of the Roman Catholic Church. One if the important aspects of Bok’s work is its link to the spiritual and cultural geography of Northern and Western Bohemia, regions that have been drastically scared by historic events damaging their social and cultural relationships. Bok has thus composed many original church pieces for chamber brass ensembles with organ (Symphonic Fanfares, 1999; Vakovian Litany, 2002; St Wenceslas Intrada, 2007; Pentecostal Intrada, 2008; Funeral Music, 2008), each of which is dedicated to a precise place. This is also the case for his piano fugues on postal codes of several parishes, for instance. He is active in these regions as conductor and prolific organiser of the local musical life, as witnessed by the fact that he has been performing the classic Czech Christmas Mass by Jan Jakub Ryba there for more than thirty years, as well as many other spiritual works (Mozart, Beethoven, Liszt, Dvo?ák etc.). Another distinctive characteristic of Bok’s work is the fact that most of his compositions exist in various versions: for orchestra, for chamber ensembles, for organ, for piano etc. This has come to be to facilitate performances, but often also on demand of many an interpreter, for whom Bok has elaborated various arrangements of parts of his spiritual works (Small Suite for five trombones, tuba and timpani, 2006; Chamber Carols for flute, trumpet, timpani, organ and string quartet with double bass, 2007; K?inice Suite for horn and string quartet, 2008 etc.). For some of his friends, he has also elaborated many arrangements and orchestrations either of their own works (Jaroslav Novák, Jaroslav Pelikán, Václav Krahulík) or of works by great composers of the past (orchestration of J. Brahms’ Tria in E Flat Major Op. 40 or of A. Bruckner’s Motets and movements of symphonies, arrangements for wind ensemble of L. van Beethoven’s and J. Haydn’s string quartets). Bok’s musical creation for film director Ji?í Strach (The Lord’s Angel, 2005; The Girl Who Stepped on Bread, 2007; Three Lives, 2007; The Devil’s Trap, 2008; The Lost Portal, 2011; St John’s Wreath, 2015) is a whole separate chapter and has often served as a preparatory laboratory for more personal compositions. Miloš Bok lives with his wife and seven children on a presbytery in the village of Mo?idlec, in Western Bohemia. Given his reserved views on liberal society and its values, he has only sporadically been appearing in the official musical establishment; as composer and conductor, he has the deepest respect and admiration of some of today’s best musical interpreters and of the public.